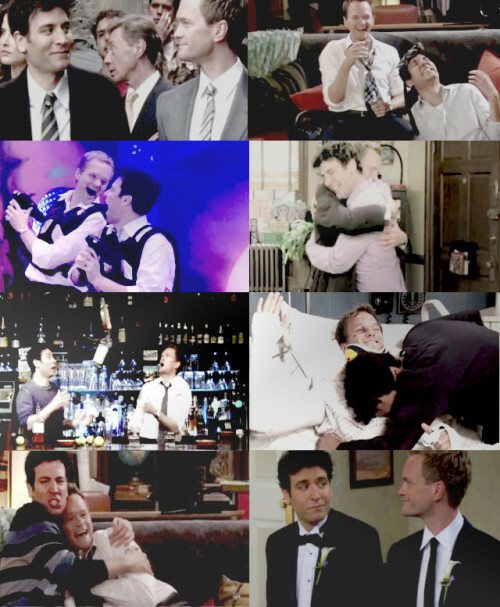 Best Brothers [ Barney/Ted ] #6 ~ "But the way I see it, we're a team. Without you, I'm just the dynamic uno." #5 - "Ted, if you have a crazy story, I was there. It's just the law of the universe." Barney: Of course, we should buy a bar! Ted: We should totally buy a bar. Ted: Oh thank God! Barney Stinson needs you right before his wedding, you assume there's at least one dead stripper in the closet. Barney: I picked the right tie didn't I? Barney: Ted, get your coat we're leaving. Ted: What happened to the cute broad you were grinding with? Barney: Promise not to tell anyone ever in your life? Ever? This can't be one of those stories...'funny time this one time Barney was...' none of that. Promise? Barney: Alright, they better be making a new gender, because I'm revoking your dude license. Ted: Yeah, how was that manicure yesterday? Barney: Ted what is my one rule? Ted: You can tell how old a girl is by her elbows? Barney: My other one rule. Ted: Flax seed relieves upset stomach? Ted: Always have a fake pair of concert tickets in your pocket in case Lily invites you to something stupid? Ted: Labanese girls sprint to third base and then stay there. Barney: New is always better! thanks Alex! also thanks for finding the actual quote. the bottom gif set is so cute! the one where they're sleeping on each other. I can't remember where the hug in the middle left is from, the one in the car..
oh, okay, it's cute cause barney like throws himself on him. he probably was expecting a hug but not like that. You're both welcome! I had no idea what the OP here even looked like.